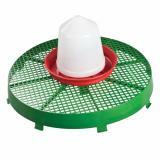 Designed to lift all drinkers and feeders up out of litter to provide a cleaner location around high traffic feeding areas. More hygienic, less work to keep clean. 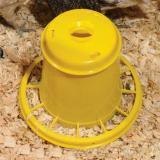 An easy to use push fit feeder for chicks. 2 or 3 pound capacity. 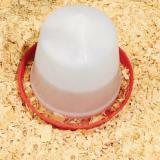 A low-cost plastic feeder. 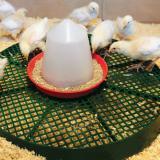 Grill reduces wasted feed and prevents perching. Use for adults, chicks and ducklings. 0.5, 1 or 5 lb capacity. 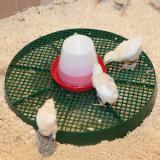 Simple design for watering chicks that's easy to use and clean. Number of reviews: 39 customers reviewed this product. Recommended: 35 out of 39 said they would recommend this product to a friend. I hesitated buying this thinking I could come up with something that would work just as good. I finally ended up buying two and I wish I would've bought them sooner. I have 10 little silky chicks and bought one for the food and one for the water. A definite thumbs up! I have ss plans that fire exactly in hole in the middle. 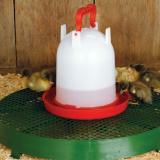 The pan will not spill and chicks cannot kick straw into the water. Other containers can be set on top as well. I am giving this 4 stars because I wished that it came in a smaller size. I really do like this though. 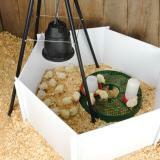 I can put my chick grit in the middle with two small waterers on either side. I do put some shavings underneath the grit holder to give it some support. I love that the damp shavings are all at the stand. Kind of pricey, but it is solid and should last forever. It definitely helps keep the drinking water clean and prevent a wet floor. 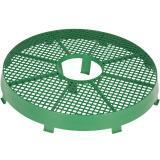 I bought this on a whim, thinking that if the duck brooder could be just a little less soggy/stinky/nasty this year, that would be a win. I've got 13 ducklings in the brooder, they've been there for a week, and I haven't had to change their shavings until today. The water stays clean, the ducks are dry, the feed is dry, the shavings are dry. Best $20 I've spent in a long time.